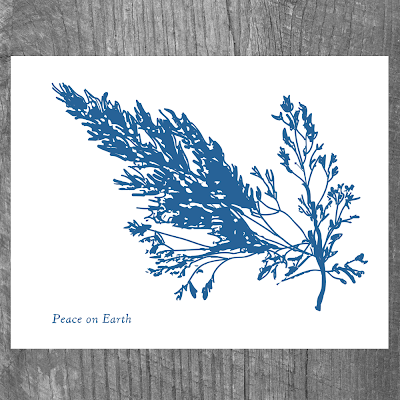 Matt and I just launched our new mini-collection of Handmade On Peconic Bay Holiday art print cards, which was challenging because we don’t love the crass commercialization of the holiday season. Today is Black Friday, the late Autumn festival of competitive discount shopping, in case you missed the Christmas-crazed housewife in the Target television ads during your Thanksgiving reruns. And yet the Winter Solstice is inevitable in the northern hemisphere, so we participate in our own possibly pagan way. 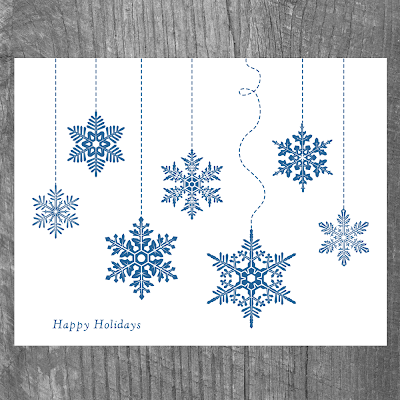 For instance, when designing our holiday greeting cards, lengths were taken to avoid referencing candy canes and Christmas trees, and certain colors were immediately eliminated, including stocking red and forest green. Instead, we created a palette of subtle organic colors with names like Ocean, Earth, Marine, Grass, and Soil. In order to avoid images that seemed too kitsch, we axed the Christmas wreaths, angels, reindeer and Santa Claus caps in favor of botanicals, bird’s nests and dancing snowflakes (well, the snowflakes are kind of kitsch, but in a cool way). Then, in a perhaps misguided attempt to fit in and not completely alienate the folks who prefer that nostalgic holiday feeling, some traditional festive slogans were added in a vintage font. One thing I think we can all agree on is that blue is perhaps a more universal color to represent the myriad of multicultural Winter festivals that take place this time of year. We happen to celebrate both Hanukkah and Christmas, so a few years ago Matt brought home a snow white fiber optic techno-tree with filament branches that twinkle with the cool blue glow of pre-programmed energy saving LED's. We’ll decorate it with a variety of white abstract ornaments and have ourselves a merry little Festivus. 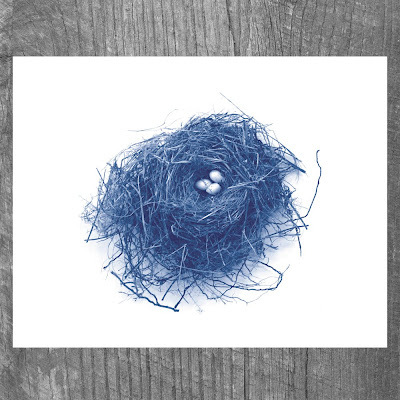 Handmade On Peconic Bay Holiday Cards, $18.00 for a set of 8 cards with coordinating envelopes, are available online at Supermarket and Etsy, and Mascot Studio in NYC. My husband, Matt Shapoff loves to cook. He picked up the habit, a few years into our marriage, when I suggested he expand his cooking repertoire from deep fried potatoes into other food groups. I’m somewhat of an amateur chef myself, having sweated away a few thousand hours in professional kitchens as a low level chef de partie, including a mediocre Hamptons fish palace and a charmingly upscale Swedish bistro. I even spent a Summer season being abused by a grumpy chef at the old Amagansett Farmer’s Market, who disliked my dicing skills intensely but taught me how to make a wonderful cold ziti pasta salad marinated in roasted garlic oil and flecked with fresh dill. Most nights Matt and I prefer to stay home and throw together tasty meals made with local seasonal ingredients readily available at NYC’s many farmers markets and specialty food shops. In late summer, and throughout the fall, we enjoy the bounty of the harvest, marveling at the sweetness of the corn and the abundance of good tomatoes after months of sensory deprivation. We also keep a good supply of fresh herbs on hand from Matt’s Southampton chef’s garden, which grows a little bigger each year. Herbs do better than vegetables in the sandy bay soil and salty air and we end up with copious amounts of parsley, basil, rosemary, sage, lavender and chives, most of which gets pressed and dried for Matt’s Cyanotype and Van Dyke Brown botanical prints. This past summer, in between cooking experiments with Native American ingredients and the re-working of an old recipe for squash, corn and beans we named Pilgrim Stew in honor of the first Thanksgiving, Matt created a new Cyanotype series using only pressed herbs and edible flowers from his chef’s garden. 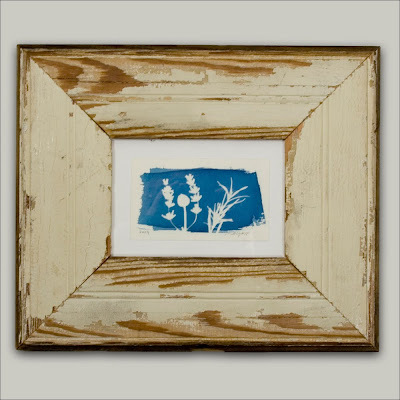 We mounted the prints in one of a kind upcycled frames assembled from reclaimed wood paneling complete with original beadboard details and peeling paint. 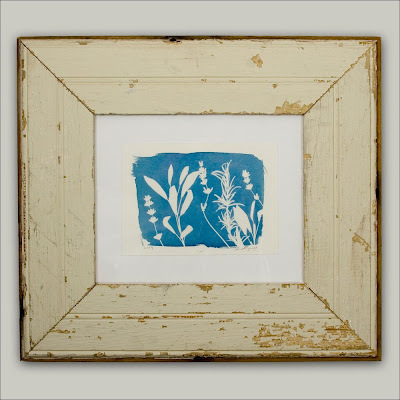 Choosing modern vintage frames made from weathered wood seemed a perfect compliment to the pale cyan botanicals, which give the appearance of being faded from the sun with age. A selection from Matt’s Chef’s Garden Series is now available at Mascot Studio in New York’s East Village. 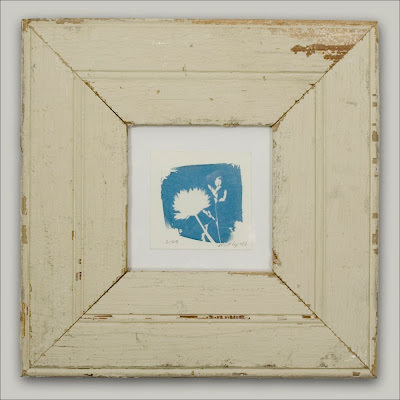 Handmade On Peconic Bay Cyanotype Chef’s Garden Series by Matt Shapoff, on cream colored Rives paper in Antique White frames, $175-$250 at Mascot Studio.